I am happy to announce that the RTM build of Veeam Backup & Replication 9.5 Update 2 is now available for download for Veeam service providers! This is the latest update for our flagship product and adds support for the upcoming release of Veeam Agent for Microsoft Windows 2.0 along with other significant enhancements and bug fixes. But when it comes to our service providers, the biggest new feature is Veeam Backup Remote Access. Let’s dive straight into this new feature! The key part of backup as a service (BaaS) offerings is full management of data protection activities and infrastructure, so service providers providing BaaS all have the requirement to connect to their customers’ Veeam Backup & Replication environments to perform on-going management and troubleshooting. Until today, performing these tasks required deploying and maintaining VPN (or similar technologies) to connect to the client sites – not an ideal solution for complexity, reliability and cost. A couple of years ago, we promised service providers that their investment in Veeam Cloud Connect will keep paying off in the future as we add more functionality on top of the Cloud Connect framework – and we’ve been fulfilling this promise ever since. 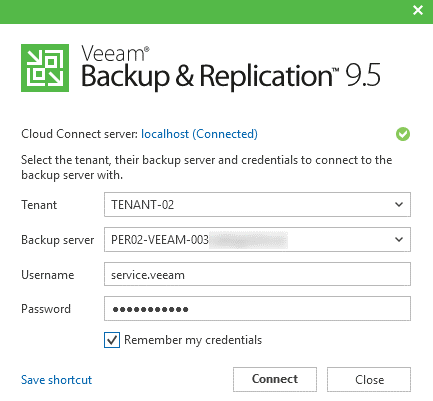 Initially, in Veeam Backup & Replication v8, the Cloud Connect framework only supported backup and backup copy jobs – but already in v9, we added support for replication jobs for the complete cloud-based disaster recovery as a service (DRaaS) solution, as well as basic remote management with Veeam Managed Backup Portal (now Veeam Availability Console). Now, in 9.5 Update 2, we are enabling a full remote backup console experience, as well as Remote Desktop connectivity to the tenant’s backup server – all through the existing single-port TLS-secured tunnel provided by Veeam Cloud Connect! Finally, you can wave goodbye to babysitting VPNs and manage your tenant’s backup servers transparently and out of the box. To further empower our new and existing Veeam Cloud & Service Providers (VCSP) partners to deliver managed services, in Update 2 we are introducing a new feature that enables VCSP support staff to remotely connect to a tenant’s backup server with the Veeam Backup & Replication Console, as well with the Remote Desktop client over the existing Cloud Connect tunnel, without the requirement to establish direct layer three network connectivity first. This enables remote support, troubleshooting and management of the tenant’s backup and replication jobs and the backup server itself. How cool is that? Veeam Backup Remote Access allows full remote management of Veeam Backup & Replication installations at customer sites, with the ability to connect a Veeam backup console or Microsoft RDP client to a customer’s backup server over the existing Cloud Connect tunnel. 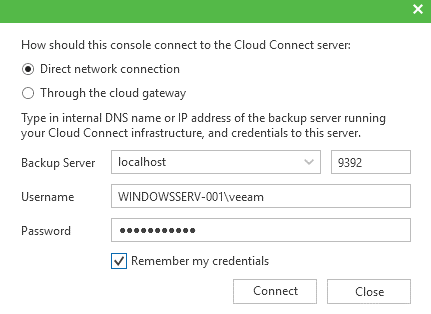 The Veeam Backup Remote Access feature takes advantage of an existing single-port TLS-secured connection to the service provider that is established from tenant’s Veeam Backup & Replication environment once they register their service provider. This allows the service provider staff to connect to their tenant’s backup server using backup console or Remote Desktop console from any computer – whether their workstation is in the service provider’s data center or on the beach of a paradise island. Both options offer the ability for the service provider to perform remote management and troubleshooting. The Remote Console can be used to connect to the tenant’s Veeam Backup & Replication server to check on job status or modify configuration, manage backup infrastructure components, or perform any other tasks you’d normally perform on the tenant’s behalf from within the console. Meanwhile, the Remote Desktop option can be used to perform troubleshooting of the backup server itself; change the OS settings, install patches and so on. Quite simply, it just works! Obviously, for security reasons the tenant must opt-in to remote management by the services provider by selecting the Allow this Veeam Backup & Replication installation to be managed by the service provider check box as shown below. And that’s it! Now the service provider can connect to the tenant’s backup server using their preferred way – Remote Console or Remote Desktop. Please note however that by default, for better security the computer running either client application must be located in the service provider’s data center and have direct connectivity to the service provider’s Cloud Connect server. So, if your support staff does end up on the road or based remotely, you need to enable them to use this feature by selecting the Accept remote console connection requests originating from the Internet check box on the Security tab of the General Options dialog of the Cloud Connect server. 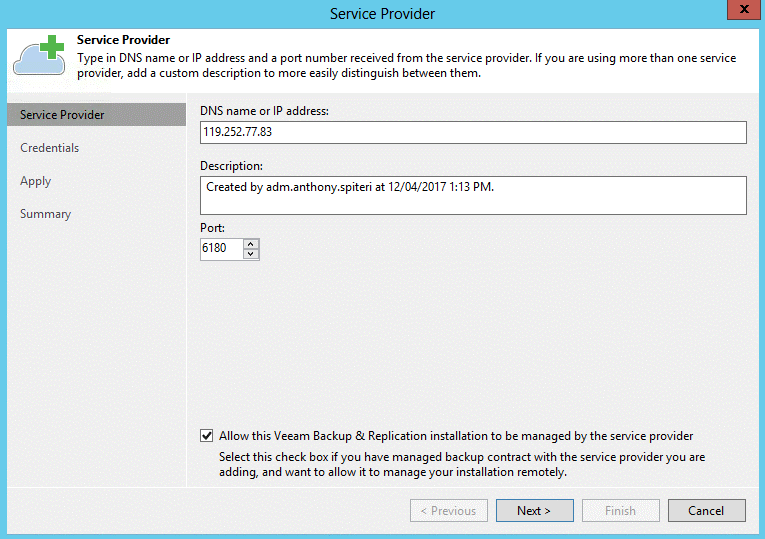 Direct network connection, for when the console is located in the service provider data center; in this case, you need to supply a Cloud Connect backup server name and port number. Through the cloud gateway, for when the console can be located anywhere on the Internet; in this case, you need to supply a cloud gateway address and Cloud Connect port number much the same way your tenants do. Just remember that with the default security settings, such connections will be refused by the Cloud Connect server. Regardless of which way you chose to connect to the Cloud Connect server, you will also need to provide an account with Full Administrator role on your Cloud Connect server. Once connected, you can select the tenant that is to be remotely managed from the list, as well as tenant’s backup server to connect to (in case a tenant has multiple backup servers). Finally, you need to specify the username and password of an account with a role on the tenant’s backup server. Yes, that’s a lot of credentials to enter – which is why we let you create a shortcut with all credentials saved by clicking the corresponding option, sending the shortcut to your desktop. If all supplied credentials are correct, the service provider console will load up indicating that it is connected to the tenant’s backup server as shown below. Once connected, you can perform all the management tasks Veeam Backup & Replication console supports except file and application item recoveries, as for now this process requires backup to be mounted locally to the console – so for performance considerations, these are best performed using a local console via a Remote Desktop client, the capability I will cover next! 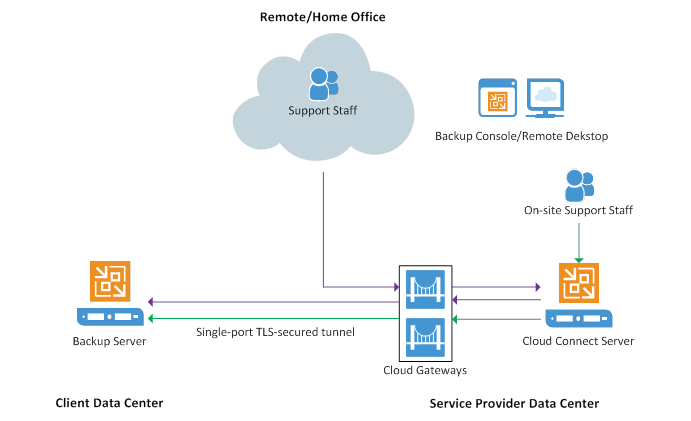 The remote desktop connection to the tenant’s Veeam Backup & Replication server is immediately established through the Cloud Connect tunnel. Of course, your Remote Desktop client will ask you to provide administrative credentials to the backup server you are connecting to. There’s no limitation to what you can do with the remote desktop session established, just remember that it will continue to run even if you close your service provider console. With the addition of Veeam Backup Remote Access functionality, Veeam continues to enhance service capabilities for our VCSPs, helping to extend their management and support offerings to better serve their clients in delivering Veeam-powered Availability. We have achieved this by taking further advantage of our existing Cloud Connect framework that continues to be a central focus of our cloud Availability platform, with even more features coming to it in the future. If only other investments made by typical service providers provided so much ROI! Wanna give it a try? Don’t wait, download now! All VCSPs already have access to the RTM build of Veeam Backup & Replication 9.5 Update 2 and can familiarize themselves with our latest and greatest technology, before it becomes generally available in a few weeks. Not a VCSP? Sign up to the VCSP Program to become one. Don’t have Veeam Cloud Connect deployed? Here’s the guide.